(Bloomberg) -- Hopes of an economic revival in Zimbabwe lie in tatters 14 months after President Emmerson Mnangagwa took office, as the nation reels from foreign-exchange and fuel shortages, strikes and a dearth of political leadership. Disgruntlement with falling living standards spilled onto the streets of Harare, the capital, and other towns on Monday with thousands of people heeding a call by the country’s largest labor group to strike against massive fuel-price increases. Eight people were reportedly killed in clashes between the police and demonstrators and 200 others were detained, according to Amnesty International, a London-based human-rights group. Under Mnangagwa’s predecessor Robert Mugabe, the seizure of white-owned farmland by ruling-party militants slashed agriculture production, triggered hyperinflation and a decade of economic stagnation, and forced the country to abolish the use of its currency and switch to the U.S. dollar. A turnaround looked conceivable after Mnangagwa, 76, took power in November 2017 and won a disputed election in July last year, but his pledges to create jobs and draw billions of dollars in foreign investment remain unmet, with businesses and consumers crippled by the lack of foreign exchange. Read more about Zimbabwe’s currency crisis. Mnangagwa’s decision to proceed with a planned trip to Russia, Kazakhstan, Belarus, Azerbaijan and a World Economic Forum meeting in Davos, Switzerland, in the midst of the crisis to drum up investment and loans has drawn the ire of his struggling countrymen who consider the former spy chief insensitive to their plight. While the official inflation rate stands at 31 percent, economists say that figure is probably understated, and there are big price discrepancies depending on whether goods are paid for electronically or with banknotes. Shops regularly run out of goods such as bread and coffee, and motorists line up for hours or even days outside filling stations to buy fuel. 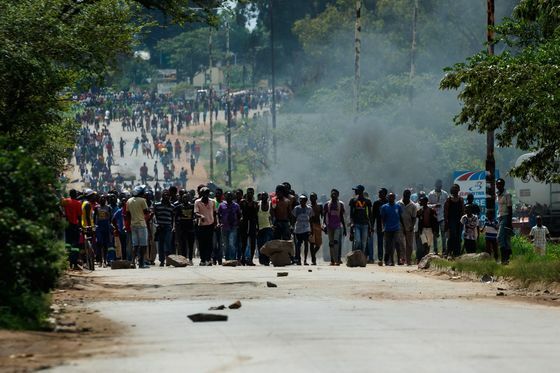 The government has ordered mobile-phone companies such as Econet Wireless Zimbabwe Ltd. to suspend all Internet services in an effort to quell rioting that broke out in several cities and towns Monday. Read more about how Zimbabweans are being affected by the economic crisis. The main opposition Movement for Democratic Change says Mnangagwa’s administration has mismanaged the currency, failed to bring corruption, inflation and the budget deficit under control and unfairly raised taxes targeting the poor. Security Minister Owen Ncube in turn blamed the MDC for organizing the three-day strike against the fuel-price increases and the chaos that ensued. Tendai Tobaiwa, 48, who sells vegetables and fruit from a wheelbarrow in the city center, said while the situation had become untenable for ordinary people, the ruling elite seemed to carry on as usual.